There are over 12,000, known different species of ants. The ant is one of the worlds’ strongest creature in relation to its size. One ant species is the most venemous insect in the world. Dozens of colonies of the worlds smallest ant could live in the brain case of the worlds largest ant. Ants move an estimated 50 tons of soil per year in one square mile. Fire ants cause an estimated $5 billion worth of damage in North America per year. Some ant species are asexual, they clone themselves and do not require any males. Ants have two stomachs, one to hold food for themselves, and one for others. Some ant species make slaves out of another ant species. 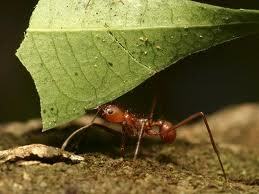 Ants can be found on every continent except Antartica. Most ants can survive around 24 hours underwater. Some wingless ants can perform a controlled glide when free falling. Ants sleep frequently and are often quite lazy. Ants worst enemies are not us, but other ants.